Teatime Games is the brainchild of the creators of popular trivia app QuizUp. That game’s developer Plain Vanilla was bought by Glu Mobile in a deal worth $8.7, with the title racking up more than 100 million players. 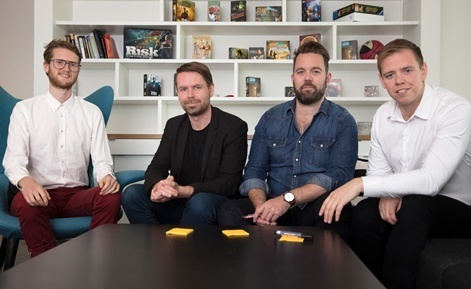 The key minds behind QuizUp, including Thor Fridriksson, Ymir Finnbogason, Johann Bergthorsson and Gunnar Holmsteinn, have since moved on to a new challenge: putting the social back into mobile gaming. The team at Teatime Games has already raised $9 million for the endeavour from seed and Series A funding rounds. Both investments were led by Index Ventures, which was also joined by Atomico. It’s the first time the two investment firms have conducted business together in nearly 10 years, which goes to show the faith they have in the team. Today, the start-up has launched Teatime Live, a video communication platform designed especially for games that enables users to chat with friends and strangers through real-time chat. It also lets uses select a ‘gameface’ – an augmented reality filter ala Snapchat. 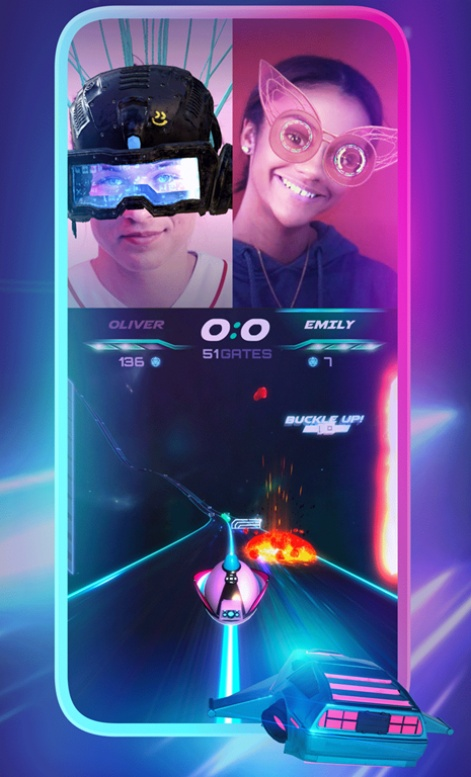 The first game launching on the platform is hyper-casual space racer Hyperspeed, where players race against each other whilst being to interact in real-time. And looking forward the company is looking to release more games and partner with third-party developers. For Teatime Games CEO Thor Fridriksson, he’s hoping to build on the success of QuizUp with further social integration. You might have some chat capabilities but you’re not getting the full experience that is to play games with other people. That game, he says, stood out in the trivia space because players could make real connections. He even attended a couple marriages after receiving invites from players who had first met within the app. “The thing that got me thinking after QuizUp was acquired, I got thinking about what games are all about,” says Fridriksson. “What struck me, which kind of seems obvious, is that people have been playing games for centuries – people have been playing board games, card games and even video games – but the one thing that’s always been a big part of gaming is the social part. The time when you meet up with your friends and meet new people. “One of the biggest parts of playing backgammon, or whatever board game you were playing, is that half the value is not in the game itself, but it was in the social interaction you had with other people. “Nowadays we have mobile games, that are really exploding and we’ve got some really great games out there, but mobile games in general have lost that part of the value of playing games together. As Fridriksson earlier points about QuizUp, as well as the integration that clans in games like Clans of Clans show, social is not a new concept for mobile. In fact, in many cases it’s a core part of the experience. But he believes there’s a young generation of people who are using video-based communication more and more instead of, or as well as, text. And part of the enjoyment of using popular social apps like Snapchat and Instagram is what the team wants to tap into. “A big part of our communication is not only through text, it is how we say things, it is how our facial expression changes when we talk,” states Fridriksson. “Our idea basically was, why don’t we try to mix this together? Right now we’re at the juncture where we have the devices and we have the capabilities where we can actually do this. A big part of our communication is not only through text, it is how we say things, it is how our facial expression changes when we talk. Outside of simply being able to chat with other users through video in real-time, a number of other social features have been integrated. Players will have a likeability score – which Fridriksson knowingly jokes might sound like something from Black Mirror but that has noticeable benefits for players. Users can rate others after a game and it’s hoped this will encourage good behaviour. Other planned features include being able to form groups that can play against other groups and the ability to let users stream to people they aren’t playing against. Of course, with such social features come potential downsides. Issues might include players being shown something they shouldn’t or receiving abuse. Fridriksson says Teatime Games has taken several steps to prevent this. First of all, users must sign in to create an account through the platform, logging in either through Facebook, a Gmail address or their phone number. There will also be moderators who will aim to quickly deal with any inappropriate actions from users, while players can also rate and report bad actors themselves. As for the live video, when a face is no longer detected, Fridriksson says the camera will blur out other images. “We have run games before with big volume, like QuizUp,” explains Fridriksson. “When you have lots of people there is always going to be someone that posts something that is inappropriate or does something. And we just have to be quick to react. “All social platforms are battling this all the time and we have to rely both on our own moderation team and also on user moderation. The first game Hyperspeed is rolling out today, but other titles are also in the works. Teatime expects to be working with other developers and have around five to six game releases this year on its platform. And as it gets better at integrating games from third-party developers into the platform, Fridriksson says we should “see an exponential rise in that number”.